In this tutorial, I will show you how to create routes with ASP.NET MVC 6. When using MVC 6, you don’t create your Route collection yourself. // we want to respect any changes to the DefaultHandler. 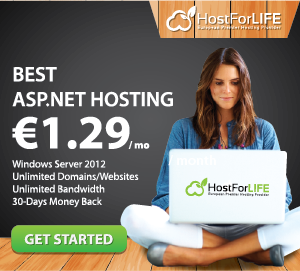 Try our Free ASP.NET MVC Hosting today and your account will be setup soon! 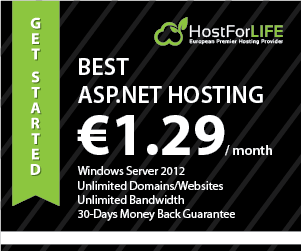 You can also take advantage of our Windows & ASP.NET Hosting support with Unlimited Domain, Unlimited Bandwidth, Unlimited Disk Space, etc. You will not be charged a cent for trying our service for the next 3 days. Once your trial period is complete, you decide whether you'd like to continue. Action methods are the obvious way to produce output to the web page from controller in ASP.NET MVC. It can be a complete web page, a string or an object. Start from today until the next few days, we're going to learn different ways to produce output to the web page using action methods in ASP.NET MVC. Each action method returns different types of action results, however, most of action results derives from "ActionResult" class so returning "ActionResult" from these controller method would suffice your need. In this part, I will show you how to use View Action Methods that are available to produce an output in ASP.NET MVC.
} The above method will render OutputViewWithModel.cshtml from Views folder to the browser. That's the way to produce output in ASP.NET MVC using View Action Method. Just look forward to further discussion in the next article. Add model validation error dynamically in the controller action method. Create a custom remote attribute and override IsValid() method. Right click on the project name in solution explorer and a folder with name = "Common"
Open "User.cs" file, that is present in "Models" folder. Decorate "UserName" property with RemoteClientServerAttribute. RemoteClientServerAttribute is in MVCDemo.Common namespace, so please make sure you have a using statement for this namespace. 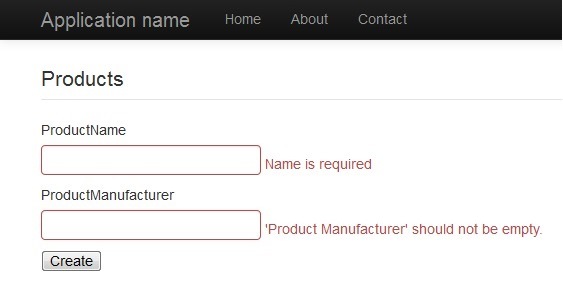 In this post, I will show you how to send form data to controller class using MVC pattern. Here, we will create simple HTML form and will send data to controller class, and then we will display same data in another view. At first, we will create one simple model class called “Person” for this example. It’s view in MVC architecture. We will create two textboxes and one submit button in this view. Step 3: Create simple Controller to Invoke the View. In this controller, we are seeing two actions the ShowForm() action is the default action for Person Controller and SetPerson() action will call another view to display data. We can see within SetPerson() action,we are creating object of controller class and assigning value to it. At last we are assigning populated object to ViewData. Then we are calling one view called “ShowPerson”. This view will display data. As in the above image, the first one (@Html.DisplayForÃ¢â‚¬Â¦) is generated by scaffolding on behalf of me (marked as a comment within the above view) and the second one is an alternative that may work. So, we do not have a hypertext markup language helper to manage pictures exploitation Razor syntax! We will develop an extension method for this that will allow us to work with pictures. Let's start. 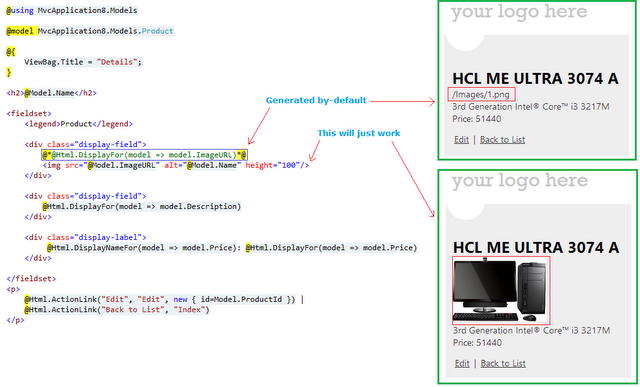 Note: Please note to use "@using MvcApplication8.Models" namespace on every view page to enable this new HtmlHelper. If you set a breakpoint on the extension method then you'll notice that the method returns the exact markup that we need. In Visual Studio 2013, what you have to do if you wanted to add area to your project is right click then selected “Add” and then “Area”, typed in the name for the Area and then Visual Studio would scaffold this. The output would be a new folder called Area, then within this you would have your standard MVC folders (Controllers, Models, Views) along with some other files that would automagically register the area within the project. But in Visual Studio 2015 Preview, this Add > Area option is currently not there. I am not sure if it will be added in at some point, but for now the process is more manual but very very simple. Assuming you have created a new Asp.Net 5 Web Application, and can see all the lovely new file types like bower.json, config.json, project.json along with the new folder structure that includes the new wwwroot folder. Add a new MVC Controller Class to your Controllers folder named HomeController. By default VS will add the basic code for your controller + and Index view. Now once you have this, decorate the HomeController class with a new Attribute called Area. Name this after your area which in this case is “MyArea”. You will now need to tell your MVC app to use a new Area route similar to AreaRegistration in MVC 4/5 but much simpler. Open up the Startup.cs file and then Map a new route within the existing app.UseMvc(routes => code. // add the new route here. Your new route will work exactly the same as the “default” route with the addition of the area. So if you now create an Index view for your HomeController and navigate to /MyArea/Home or /MyArea/Home/Index you will see your index view. In this article, i help you to learn how to use Fluent Validation in ASP.NET MVC 5 implementation. Fluent validation is one way to set up dedicated validator objects, that you would use when you want to separate validation logic from business logic. Fluent validation contains a small validation library for .NET that uses a Fluent interface and lambda expressions for building validation rules for our business objects. So, let's start using Fluent Validation! Now, we have created all the model controller. This view shows the index page and the validation check. ASP.NET MVC 6 Hosting Russia - HostForLIFE.eu :: How to show Multiple Models in a Single View Using Dynamically Created Object ? Dependency injection frameworks are becoming a common place in all modern code bases. One of the most popular dependency injection framework in the .NET world is Ninject. This post will show a very simple example of how you can get started with Ninject. Create any empty ASP.NET web application and choose the WEB API template. Create a folder called Services where you will put your business logic classes. At this point if you run it, ASP.NET will complain because no one is giving the controller an instance of ITaxService. That's where you can use dependency injection frameworks like Ninject. 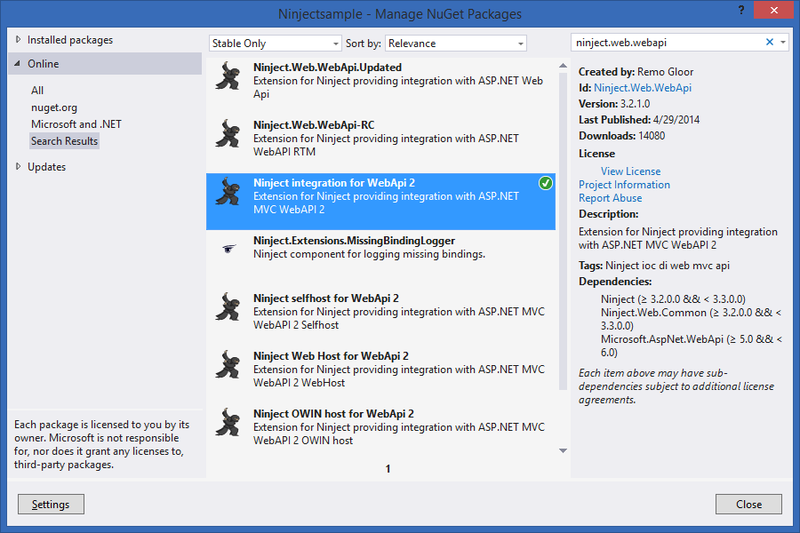 You can install Nuget package called Ninject.MVC3. Don't worry, it will work even on MVC5! Now, in the App_Start folder you will have a new file called NinjectWebCommon.cs. Now, when you go to /Home/Index you will see the tax rate. 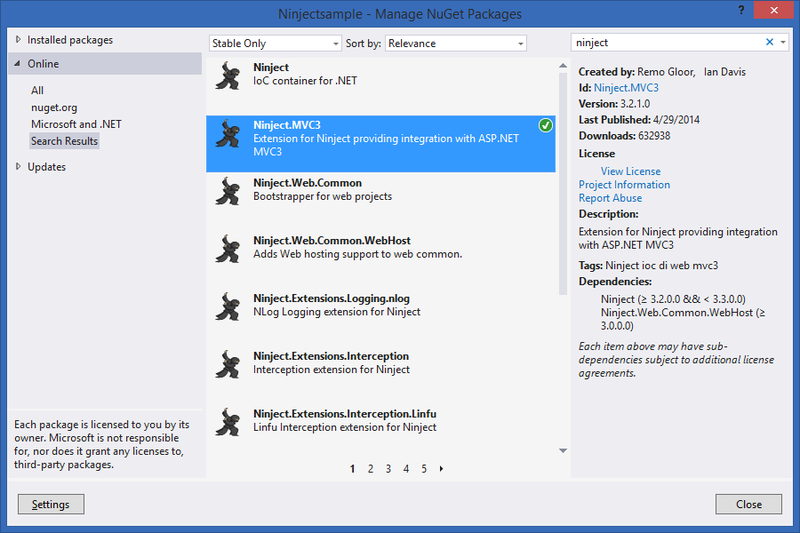 However, you need to install a Nuget package called Ninject.Web.WebApi. Now, when you access /api/values you will see the desired result.